Brown, Displaying the hidden pocket inside the primary compartment. The Ayyawear Gunslinger Stash is a finely handcrafted leather satchel ideal for carrying a concealed firearm or everyday accessories. Keep your most important possessions ready at your fingertips. This bag is made by Ayyawear, and will last an eternity if cared properly. 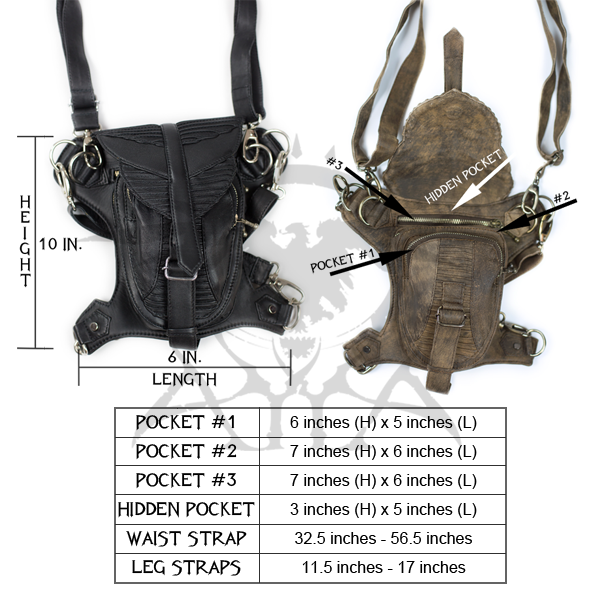 Wearable as a hip/thigh holster, a docker's clutch, a purse, or a backpack. 3 Highly adjustable straps included. A formed leather top flap keeps it nicely closed but easy to access quickly, though you can zip all of the pockets shut to keep your things more secure if you prefer. A secret pocket is hidden inside the top pocket, kept together with Velcro. + As of 1/29/2019 we are working on integrating upgraded metal hardware that is more durable than ever before.